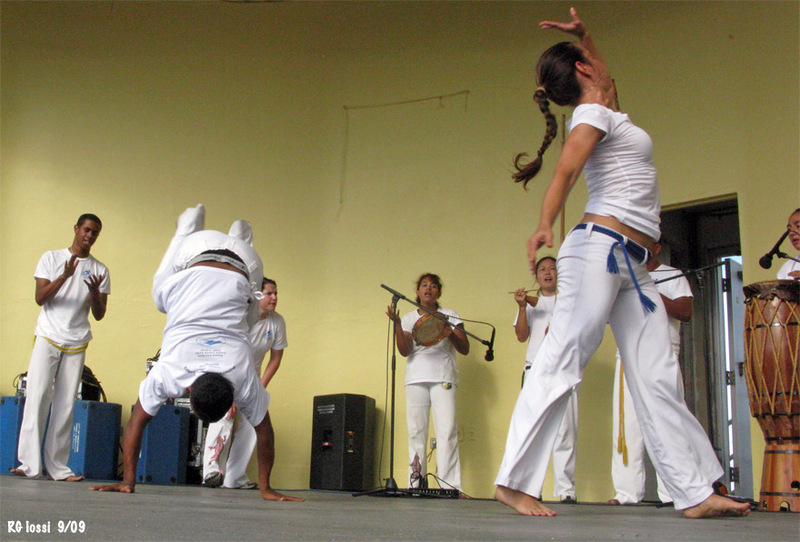 "Capoeira is a 400-year-old martial art that blends music, dance, singing, and acrobatics to create a holistic approach to teaching self-defense. 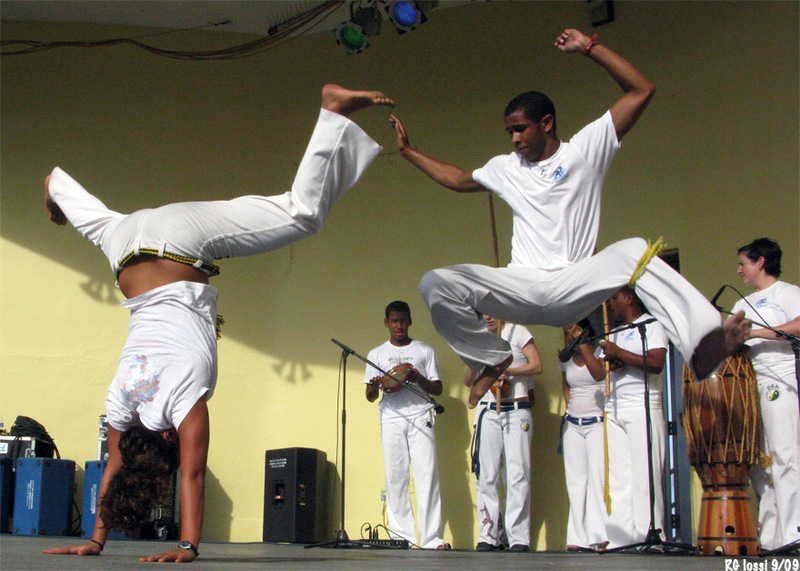 Originating in Africa, Capoeira was brought to Brazil by captured slaves from Angola. In this foreign land the Angolan people developed their practice into a method of defending themselves against their violent overlords. 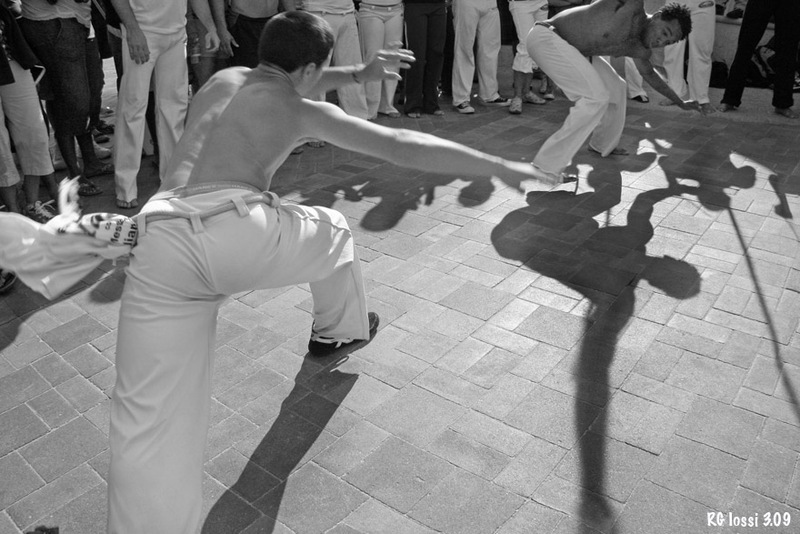 Because of their predicament, these enslaved people had to disguise their training as recreational song and dance. 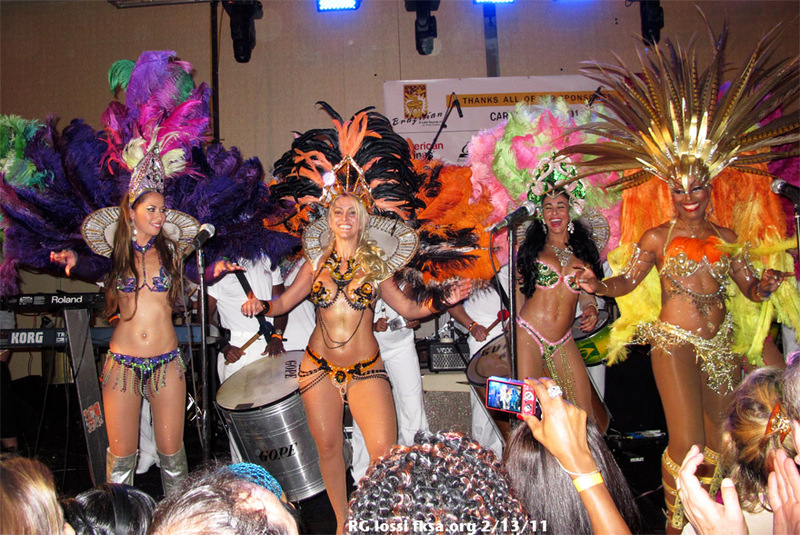 The slaves from Angola, like slaves brought to the United States, blended their familiar call-and-response song forms with the regional dialect to create songs that glorified their homeland, deities, and future freedom. 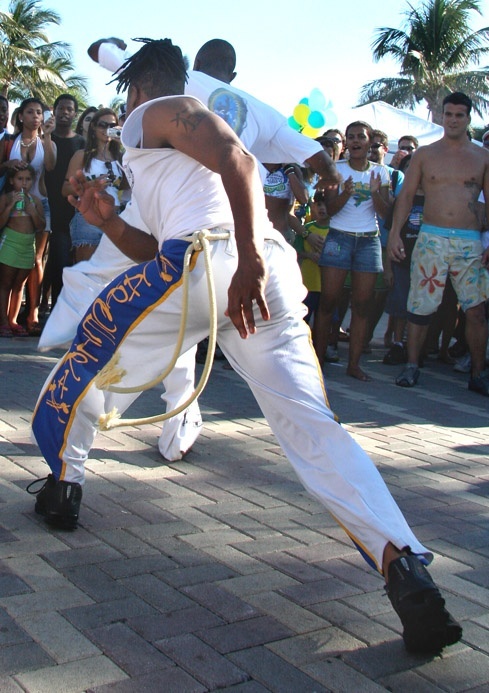 These songs were accompanied by a number of percussion instruments like the tambourine (pandeiro), bells (agogo), and, most importantly, the one-stringed instrument brought from Africa, the berimbau. 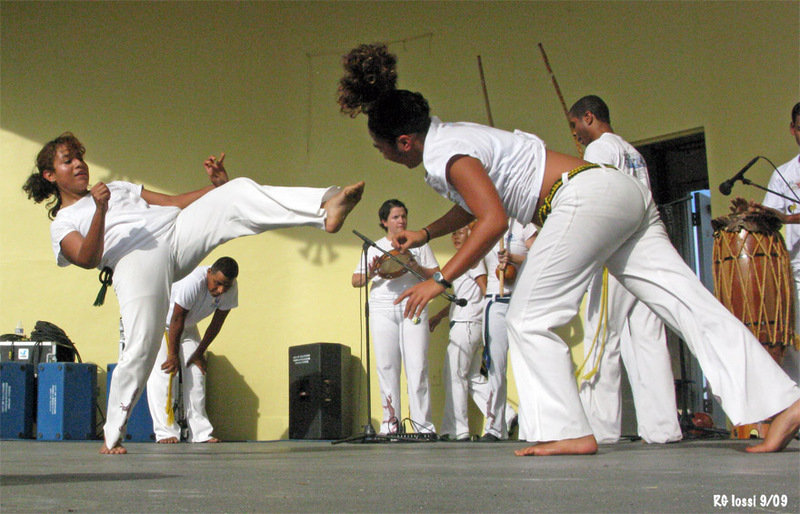 The ginga, roughly translated as swing, was created as the basic movement of Capoeira, so that two people practicing Capoeira appeared to be dancing together rather than fighting. 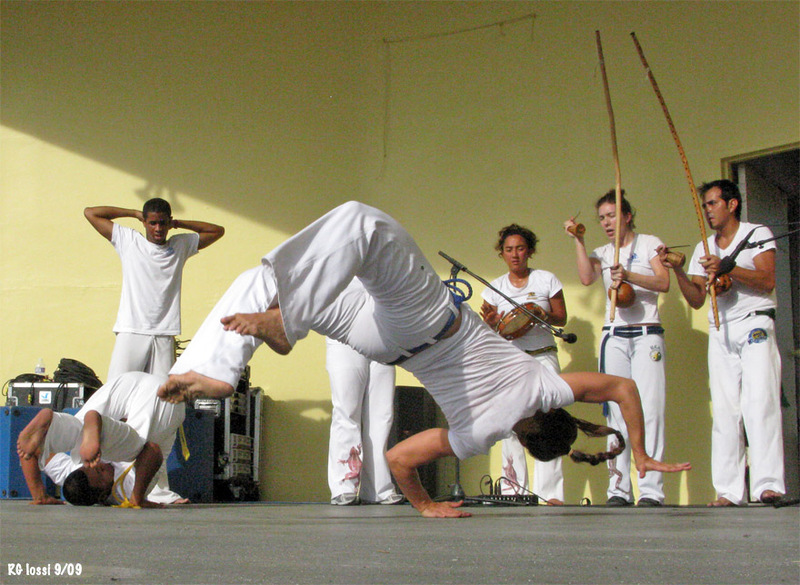 The ginga is set to the rhythm of the berimbau and other instruments(bateria) to enhance the notion of dance and also to teach timing, a critical element in Capoeira. 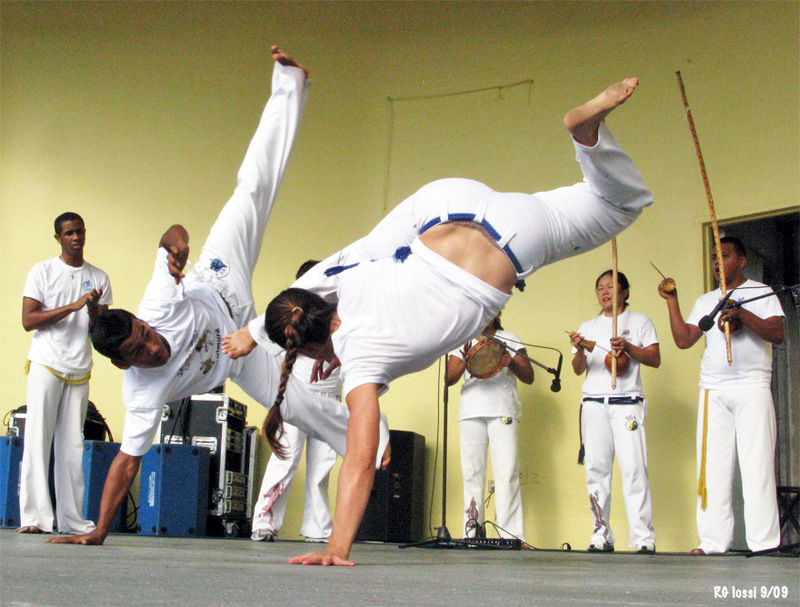 Another characteristic of Capoeira that helped to mask its purpose of defense is the avoidance of direct contact and threatening movements against an opponent. 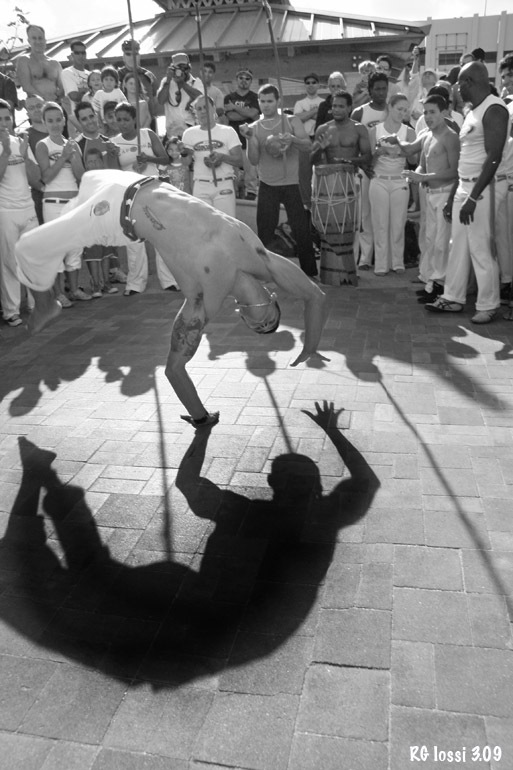 Since a slave was obviously not allowed to show direct aggression or even opposition to his master, he had to learn the art of trickiness or malandro. 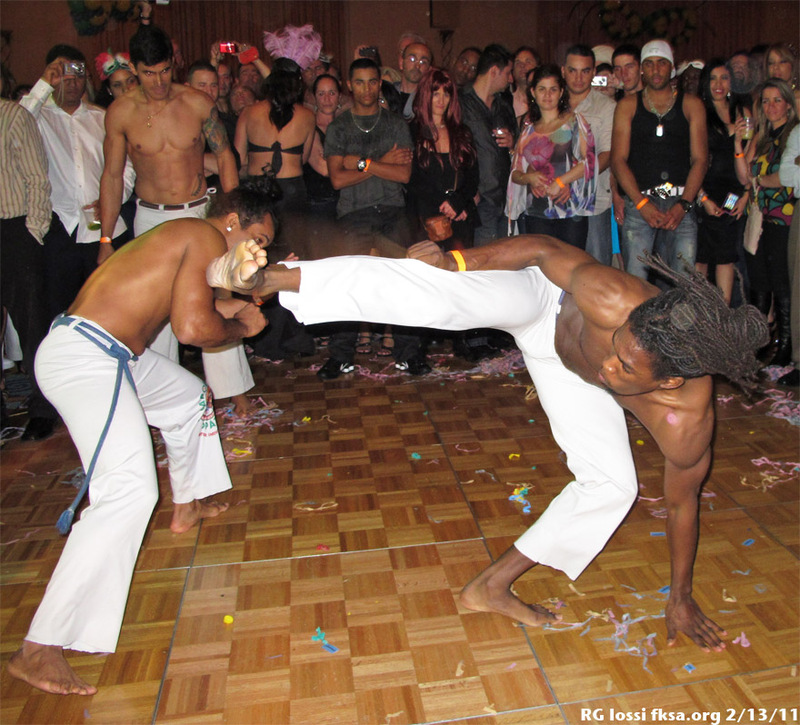 For this reason, modern capoeiristas still prize sneakiness and cunning over strength and aggression. 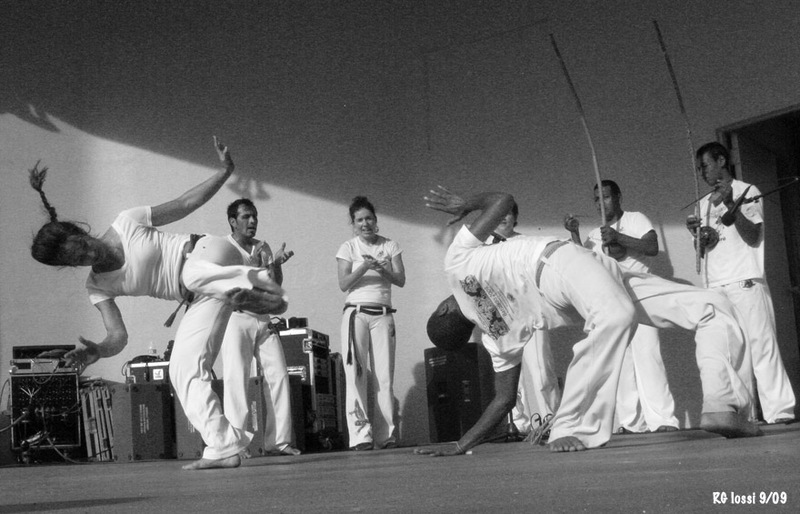 The goal of Capoeira is not to defend oneself through violence but by redirecting and avoiding violence. 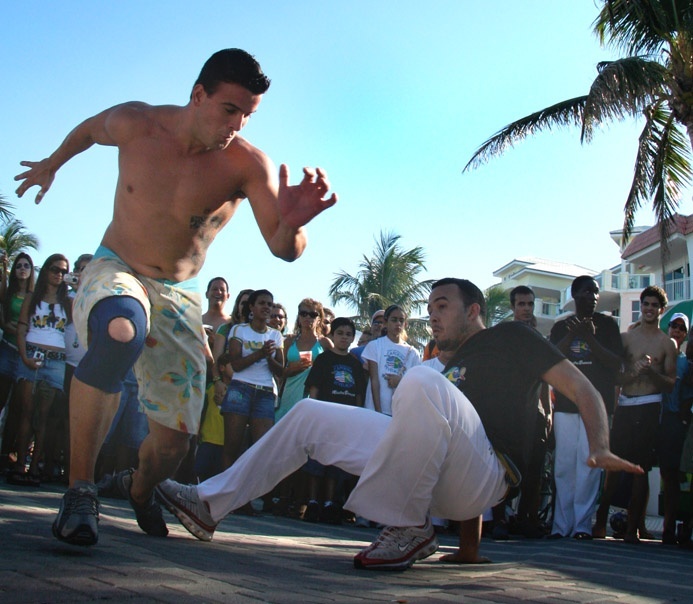 Although Capoeira was originally conceived as a non-aggressive practice, it was later used as a violent weapon by street gangs in Rio de Janeiro. 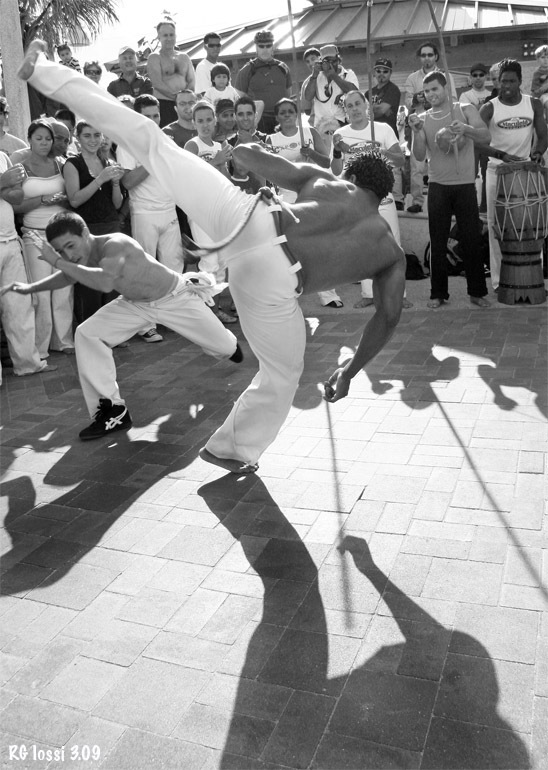 With the emancipation of all slaves in Brazil in 1888, many former slaves, lacking jobs and social status, formed Capoeira gangs and took to crime. 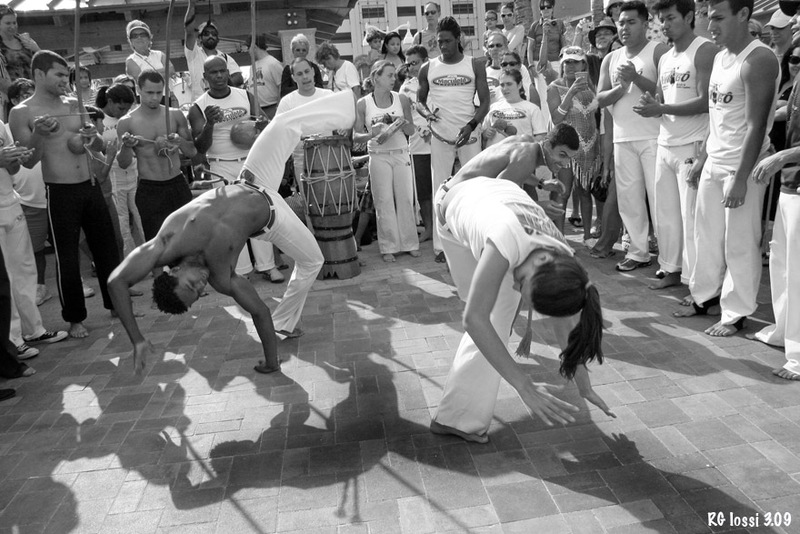 As a result of the terror caused by these gangs, Capoeira was outlawed in Brazil in 1892. 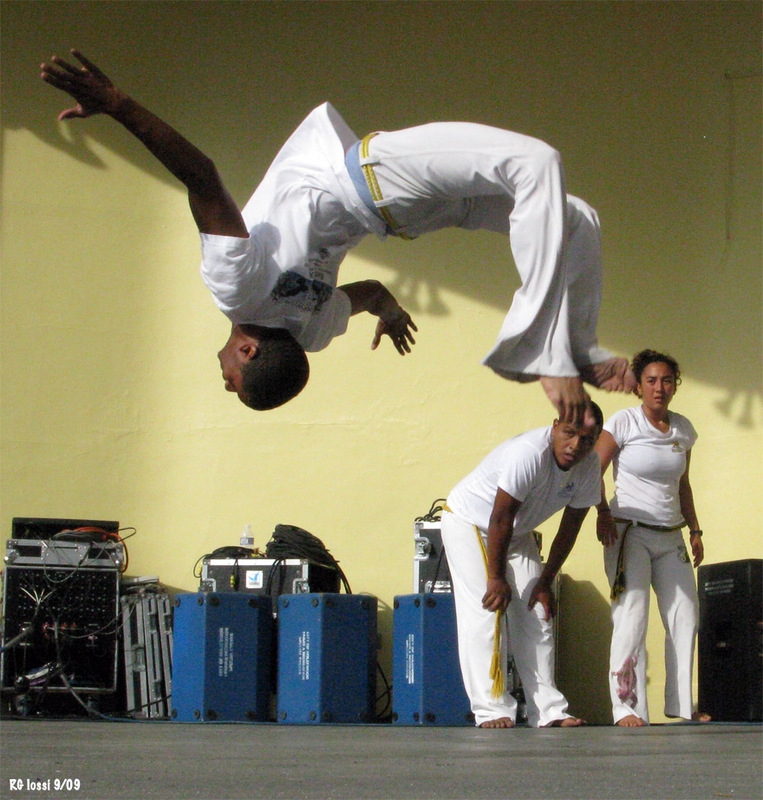 Capoeiristas found teaching, practicing, or using Capoeira were punished severely. The price was a slashed achilles' tendon, knee, or even throat. 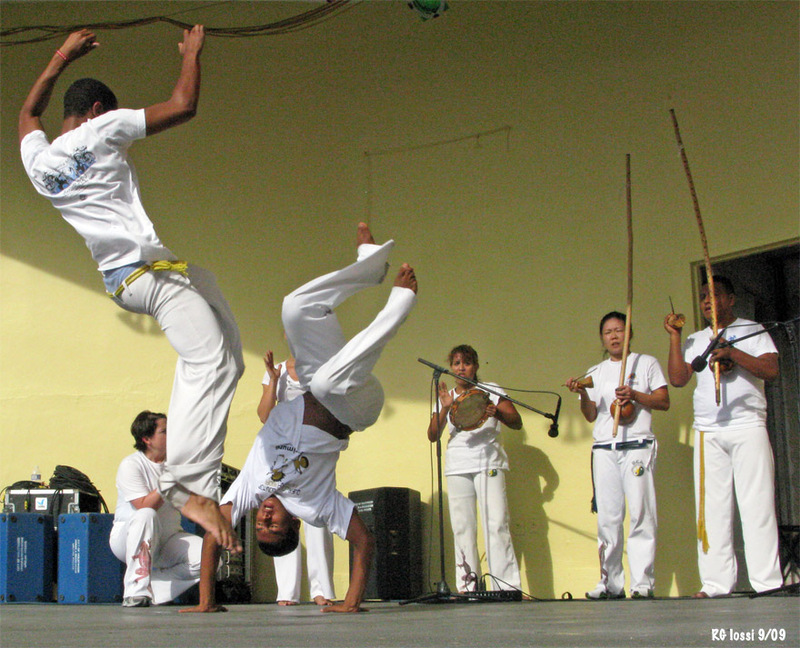 Capoeira, however, has always been a resilient phenomenon, and it practitioners continued to hand down their beloved way of life to the next generations. 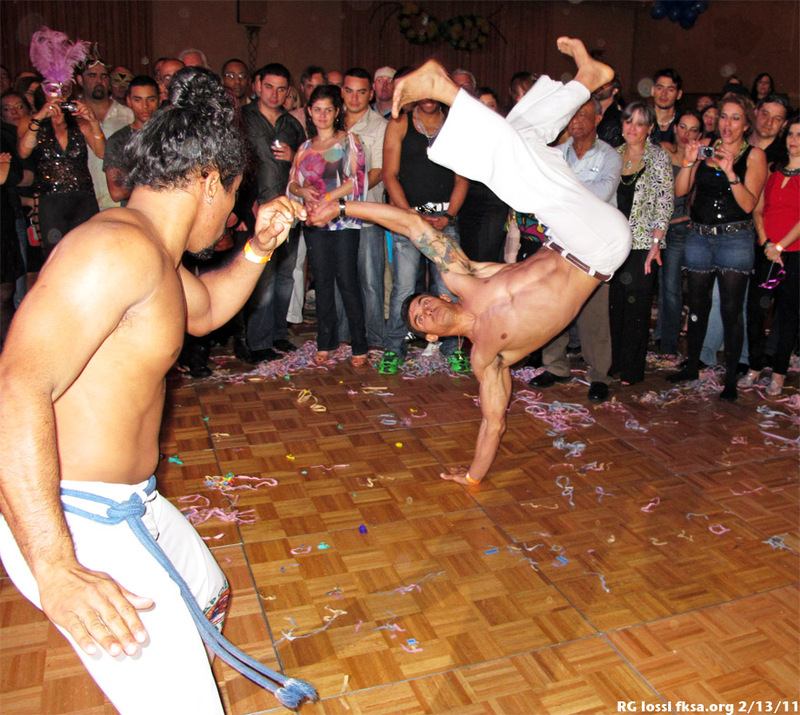 In response to the outlawing of their art, capoeiristas moved even further underground in their practice. 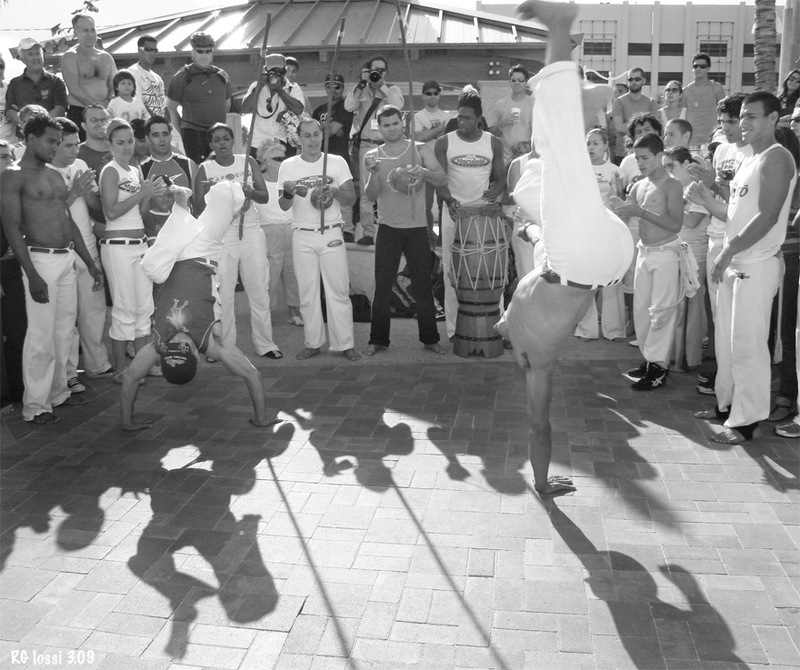 They adopted nicknames to identify each other as capoeiristas without revealing their real identities. 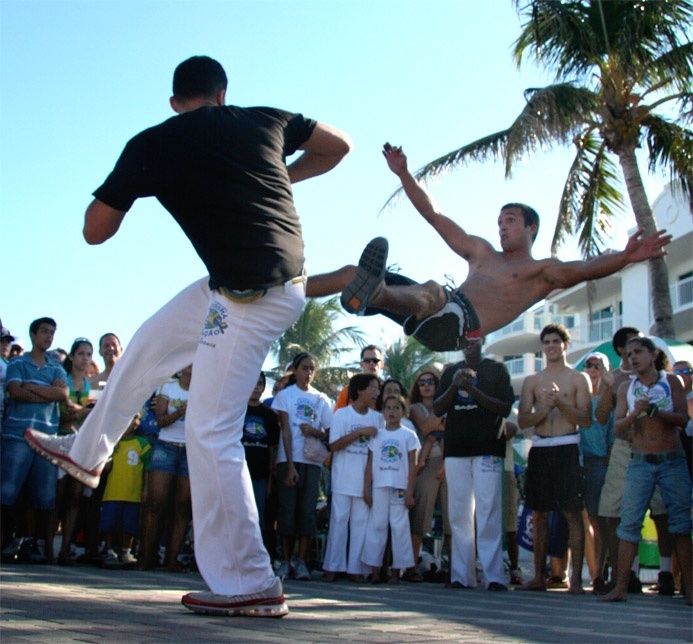 This practice continues to this day with nicknames, usually descriptive of the capoeirista's style or body type, being given to a newly "baptized" student of Capoeira. They also held their rodas in places that offered concealment or convenient escape routes if the cavalaria (police) showed up. 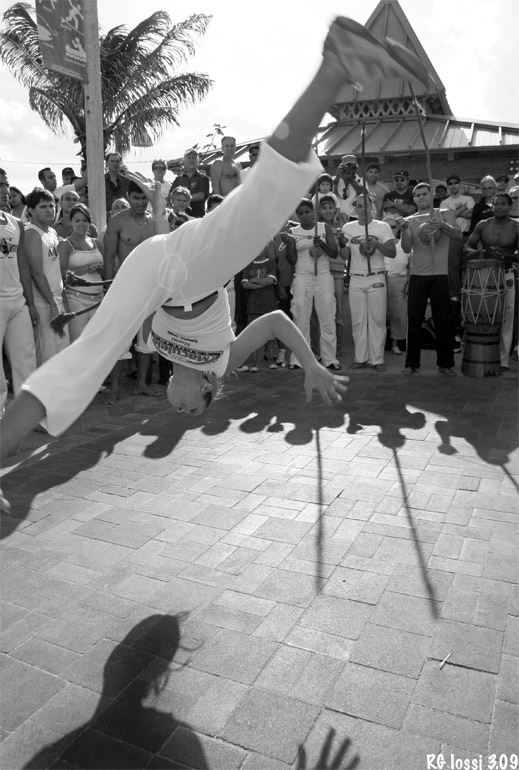 It wasn't until 1937 that Capoeira was legalized for practice in registered areas. 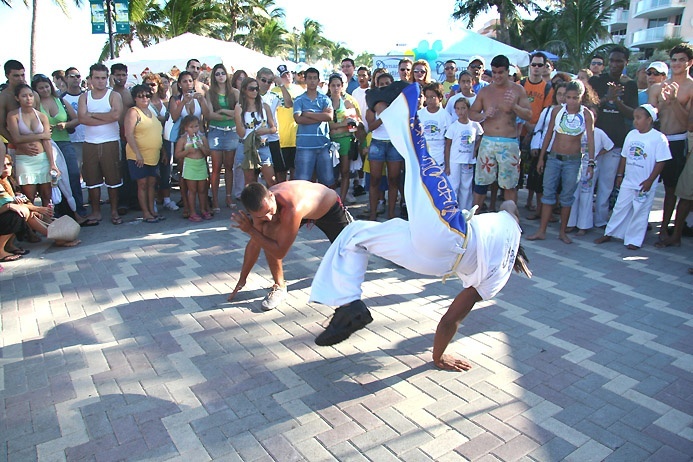 This development was thanks to the nationalistic president Getulio Vargas, who wished to promote Capoeira as a Brazilian sport. 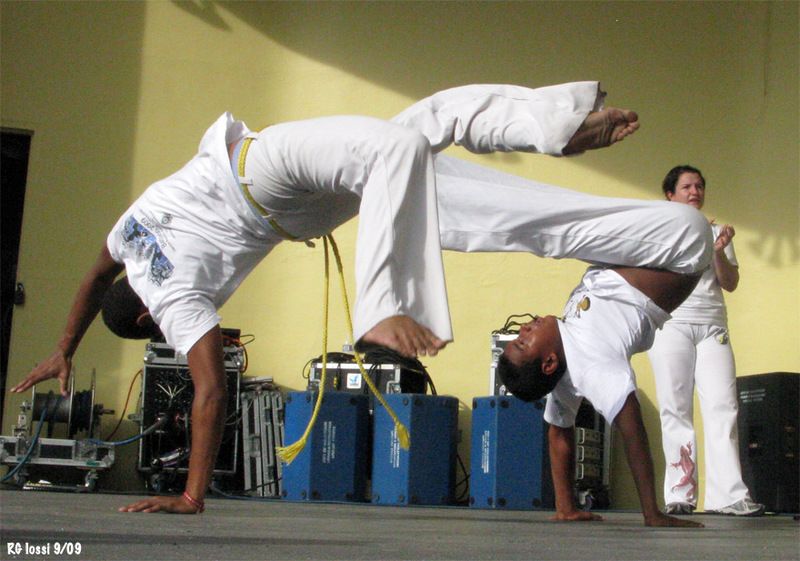 Today Capoeira is practiced all over the world. 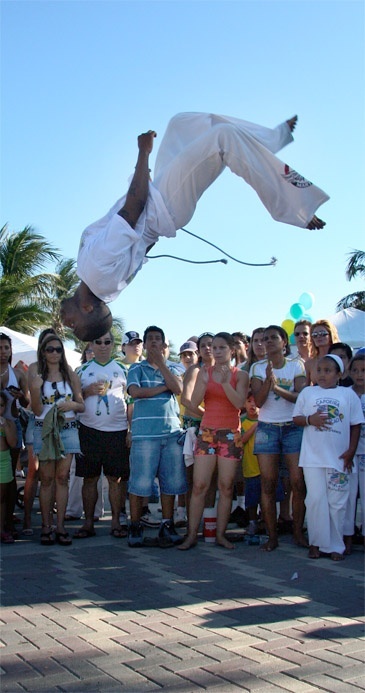 With the addition of Mestre Bimba's newer, faster style, Capoeira Regional and various attempts to blend Regional with its ancestor Capoeira Angola, Capoeira has seen some interesting developments since its liberation in the early 1900's. 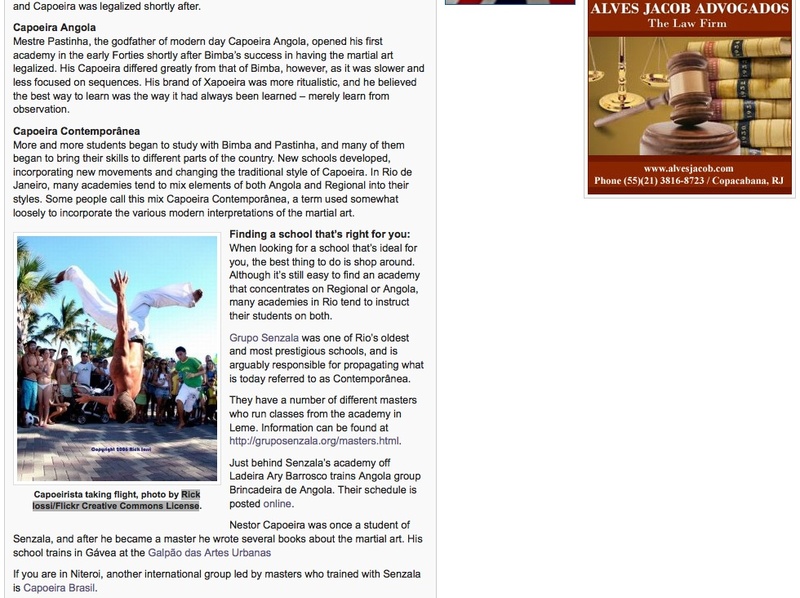 It is a renewed source of pride for Brazilians and an adopted way of life for Capoeiristas across the globe." 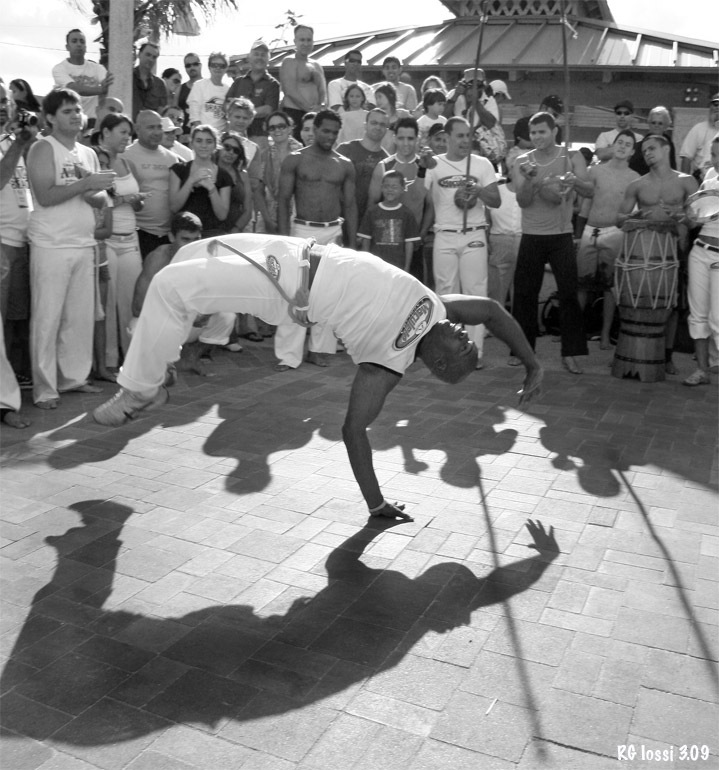 "The music of capoeira is an essential part of capoeira. It is the music which controls the speed and type of game. 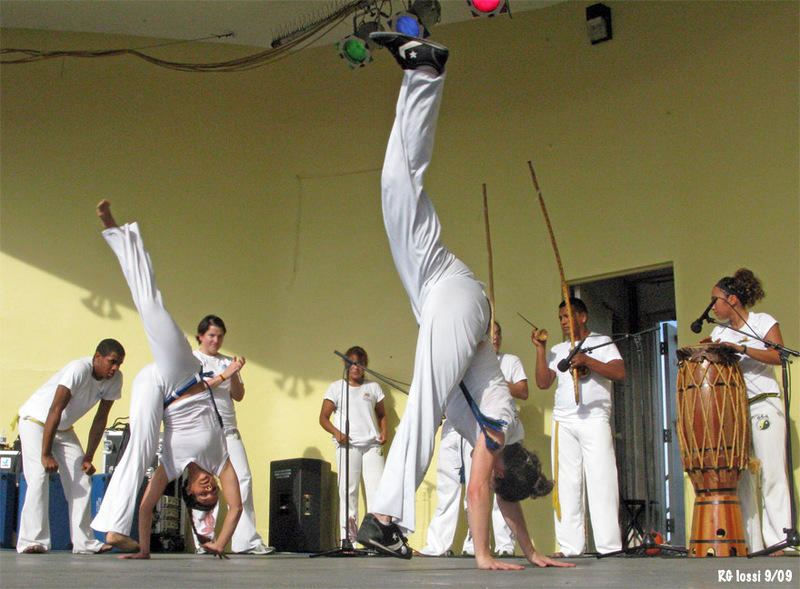 The main instruments of capoeira consist of the berimbau, which resembles a single string bow with a gourd at the bottom, and tire wire for a string. 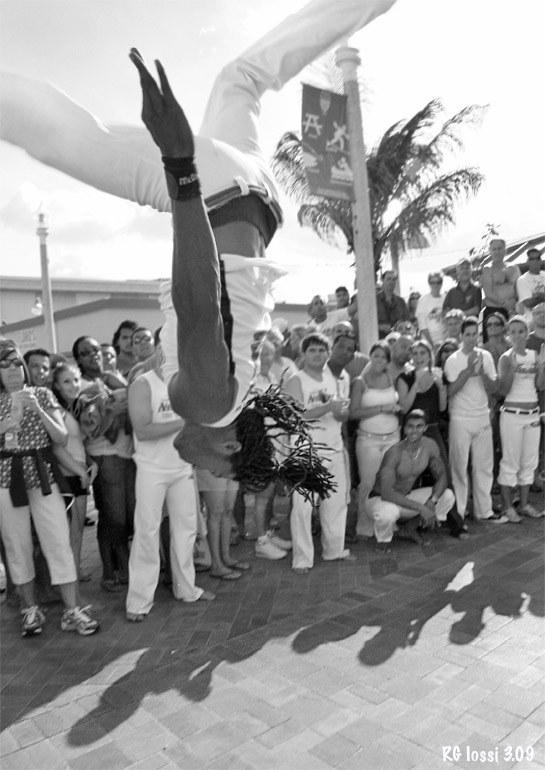 The string's tension is adjusted by generally something that resembles a large thick coin called a "dombrau", which is pushed into the string by the ring and thumb fingers. 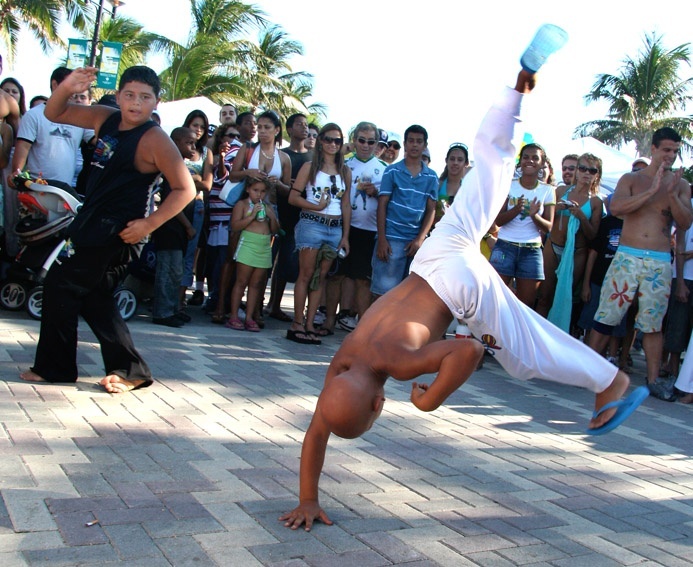 There is also a shaker that is held by the same hand as the vaqueta which contributes to the rhythm. 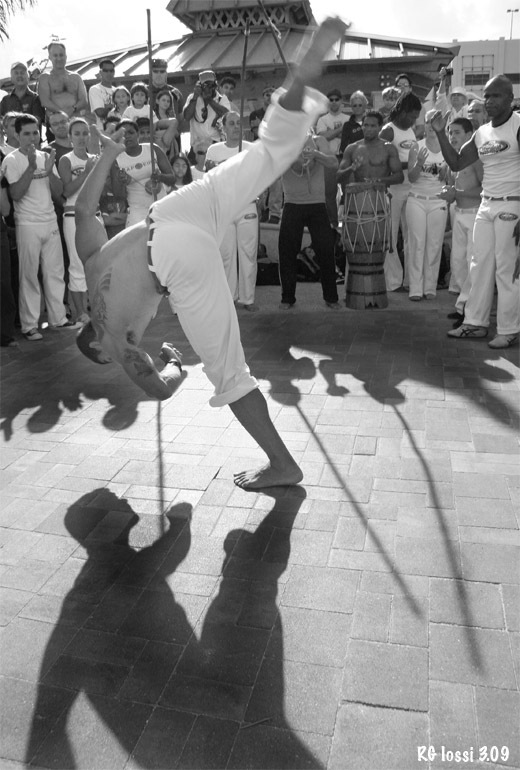 There are three notes that a berimbau can play: Open, Closed, and Buzz. 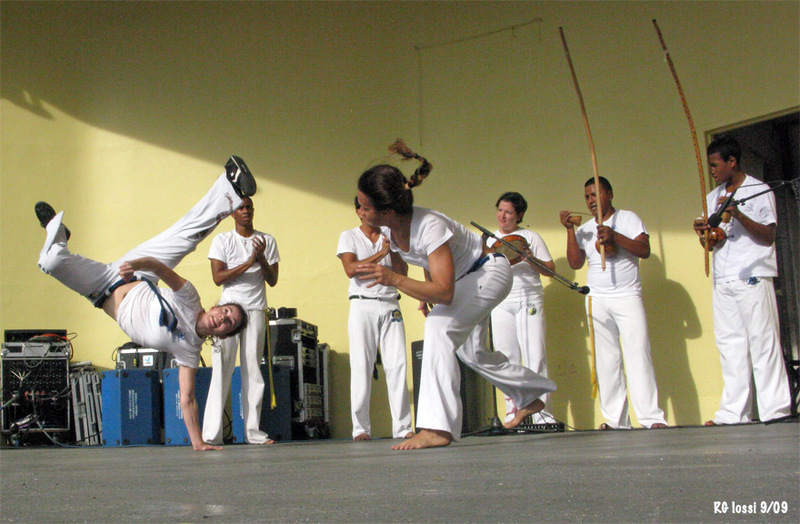 Open is when the berimbau is struck without the stone touching the string. 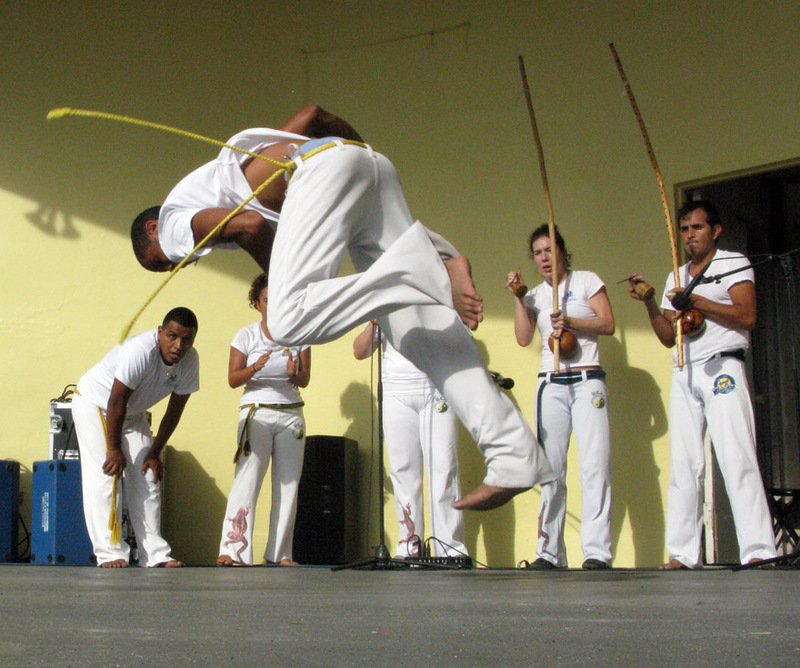 Closed is when the berimbau is struck with the stone fully pressed against the wire. And buzz is done when the stone is slightly touching the wire. 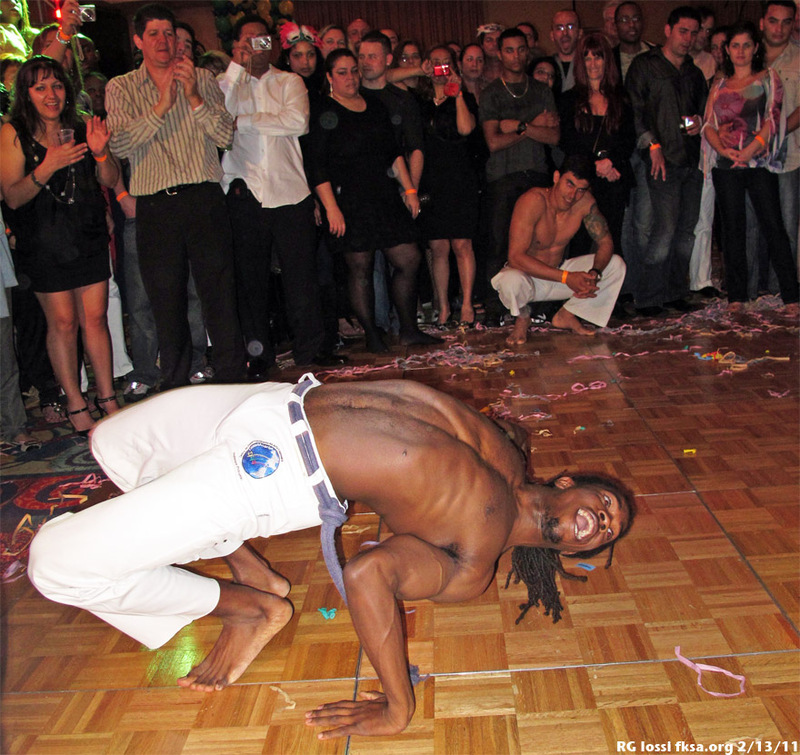 Some of the other instruments used in capoeira are the atabaque, which is a drum; the pandeiro, which is a tamberine; the agogo bell, which sort of resembles two round cowbells together; and finally there is the reco reco, which is a hollow, wooden, round shaped object with a grating. Sound is made by rubbing a thin stick back and forth on the grating." 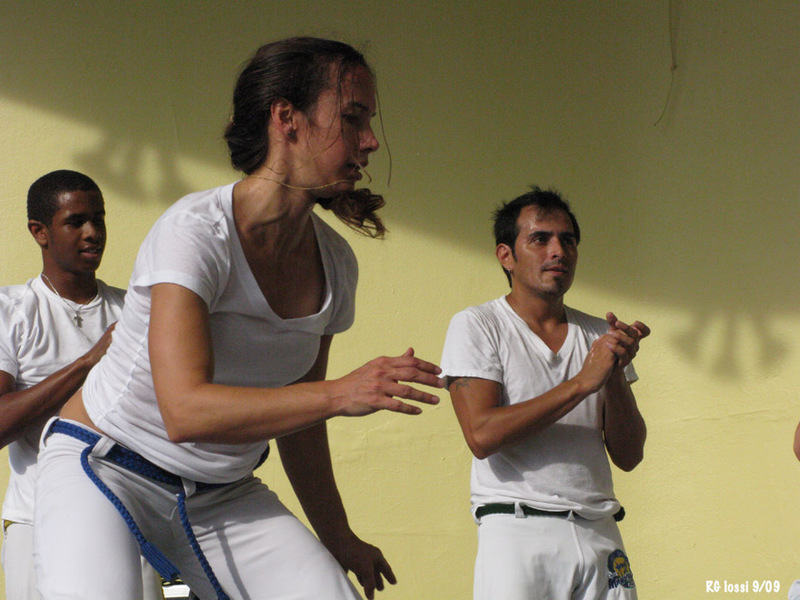 From kids to adults, girls to men, the Copeira players have at it in an adept way. All this over concrete without benefit of mats, pads or anything else other than raw honed skill. If you have a chance to see this, make a point of checking it out. It is truly amazing! Last edited by RickI; 02-03-2012 at 10:37 AM. 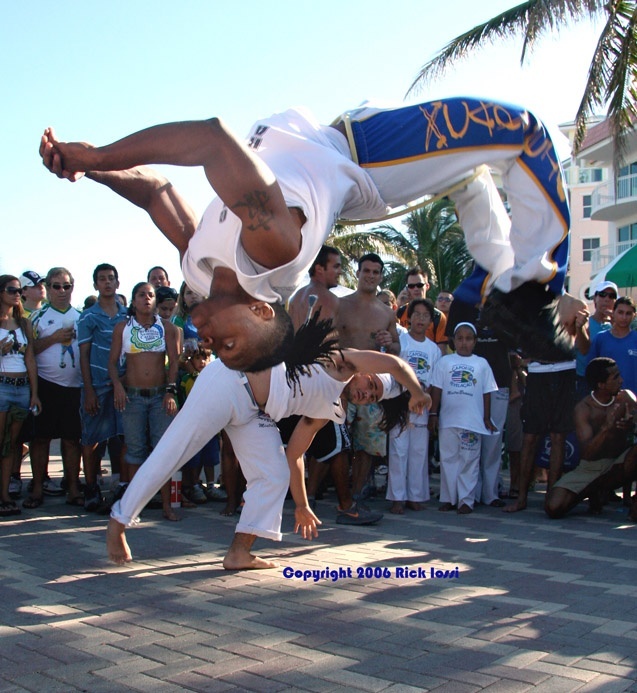 Any capoeiristas on here? I had some questions about the activity. Also, how does it help your kiting? Last edited by RickI; 05-31-2008 at 06:54 PM. 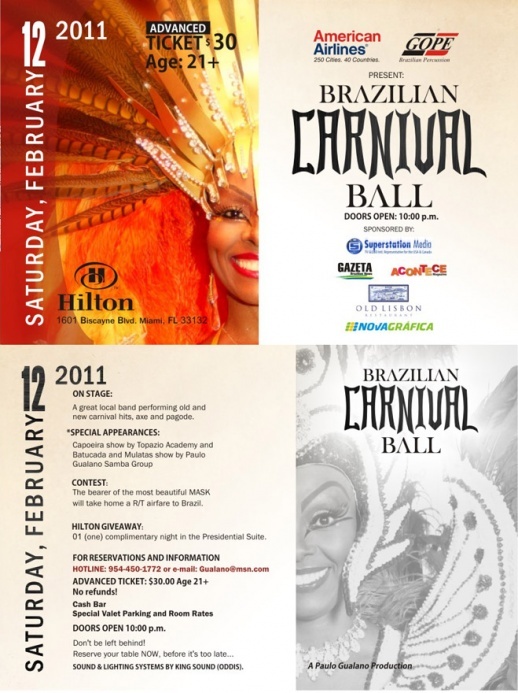 Looks like they're holding this event again this year on November 23, 2008. 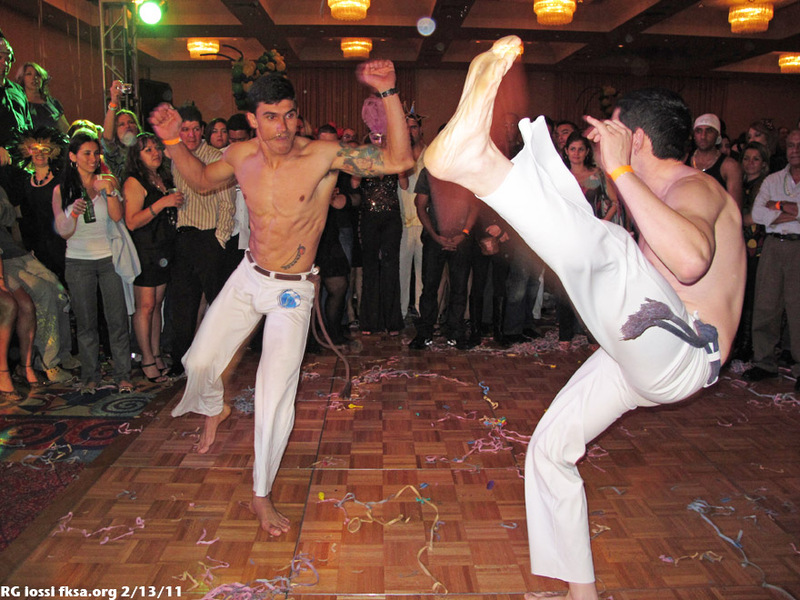 They have capoeira scheduled as well. Should be fun! 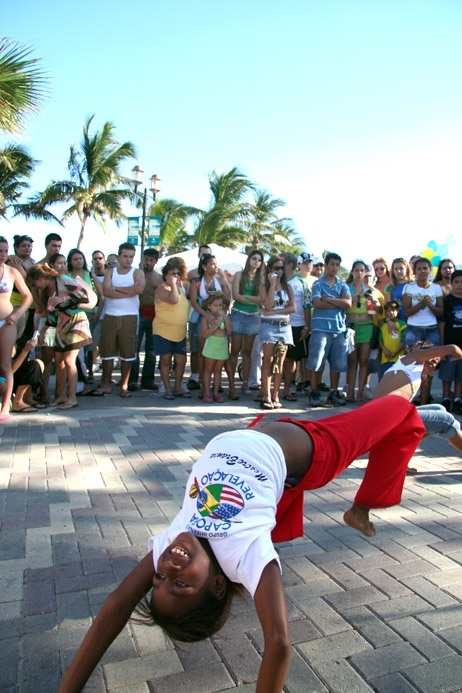 Brazil on the Beach in Hollywood this weekend, starting Friday night. 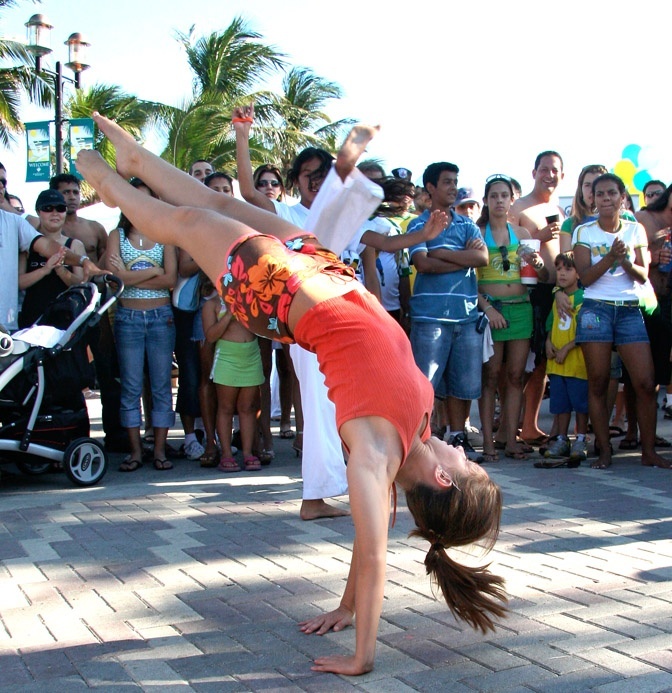 Big doings on Saturday with music, food, capoeria and in the evening Daniela Mercury. 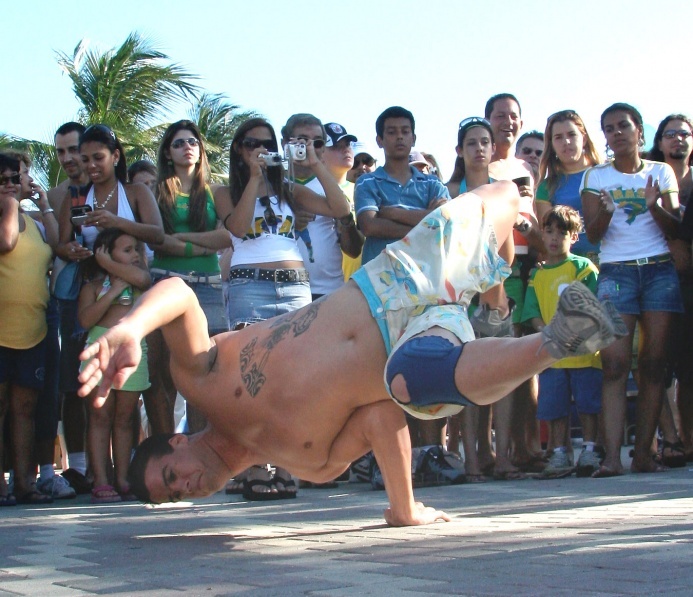 also if you've never seen it, the Brazilians are brilliant at playing vollyball, with their feet, head, shoulders but no hands! They are having a big championship in the day. Last edited by RickI; 03-19-2009 at 11:26 PM. 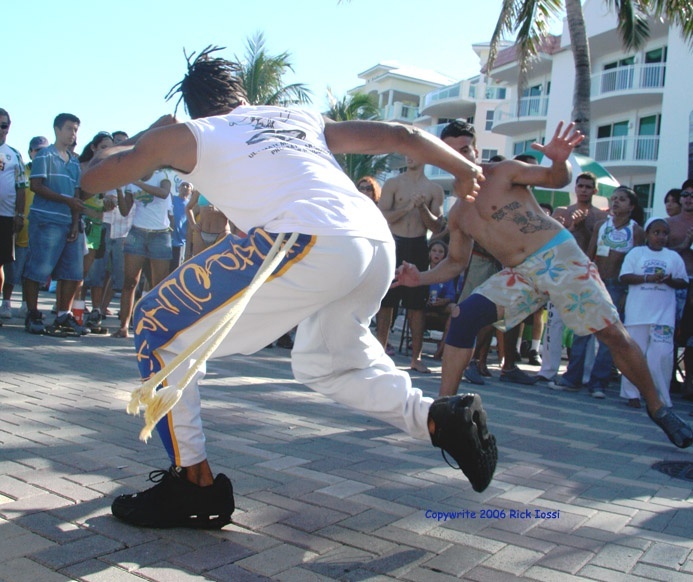 Capoeiristas came from several academia or schools including http://www.capoeiramiami.com/ and http://www.miacapoeira.com/ among others. Last edited by RickI; 04-07-2009 at 01:34 PM. 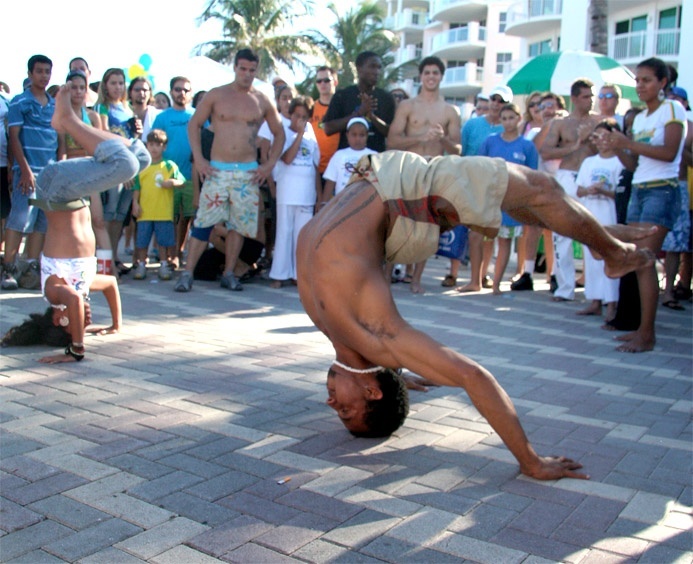 There was a capoeira demonstration at the Latin Festival on Hollywood Beach yesterday, caught some images of the action. 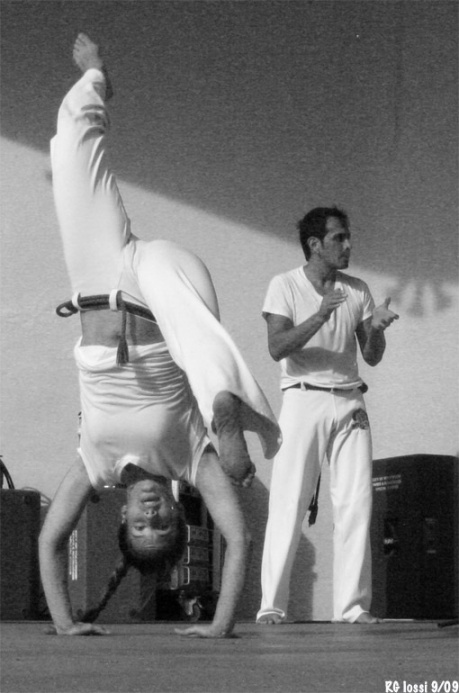 The school performing was Miami Capoeira Sol E Lua, http://www.miamicapoeirasolelua.com/ led by Instructora India. ps - these are Canon G9 shots for once, left the DSLR at home this time. Last edited by admin; 09-21-2009 at 09:24 AM. 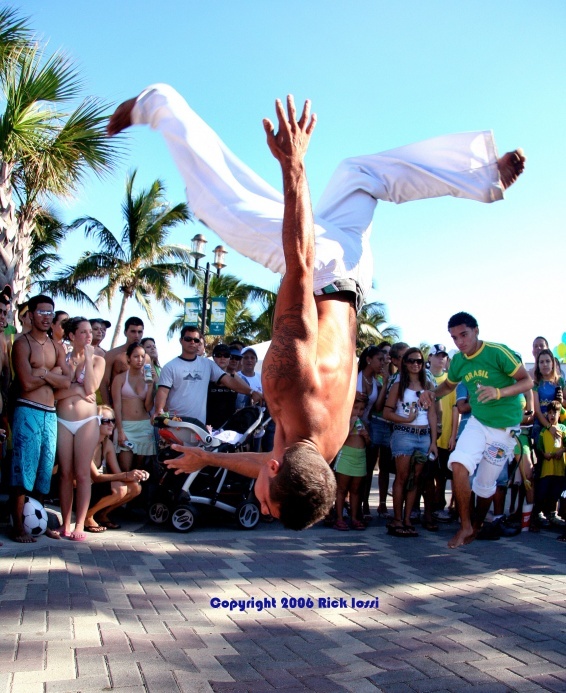 Great action pictures! 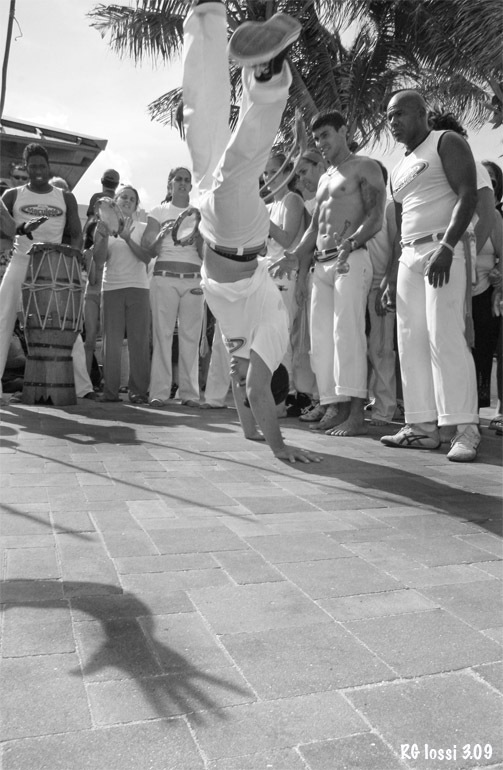 I recently got into Capoeira as I was looking for something to keep moving during the summer and love it! It's a great addition to kiteboarding. 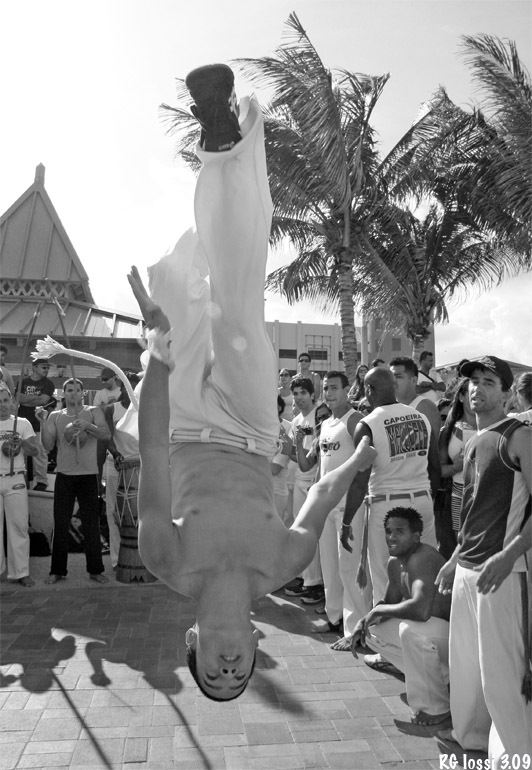 There are many "rodas" in Miami. 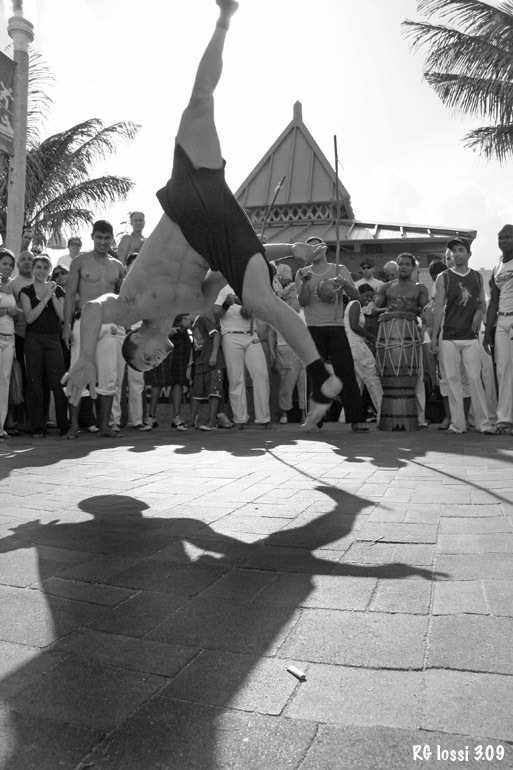 I choose Fight Club (www.fightclubmiami.com) as I felt it was pretty low key to start. You can try the first class for free. PM me if anyone wants to try it out and I will tell you when is the best time to come. 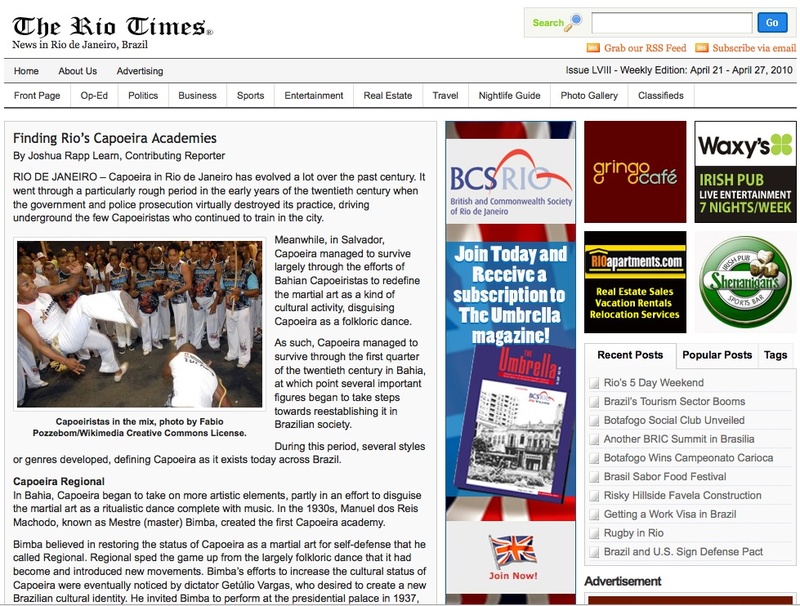 Just tripped over the first photo in this thread in a Rio de Janeiro, Brazil newspaper article dealing with capoeria from January 2010. Don't remember putting it in Commons, strange. 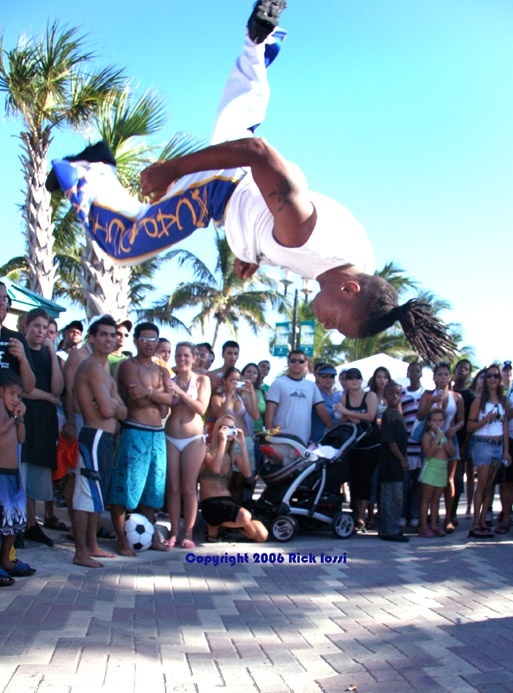 It was taken four years ago in Deerfield Bch, FL. 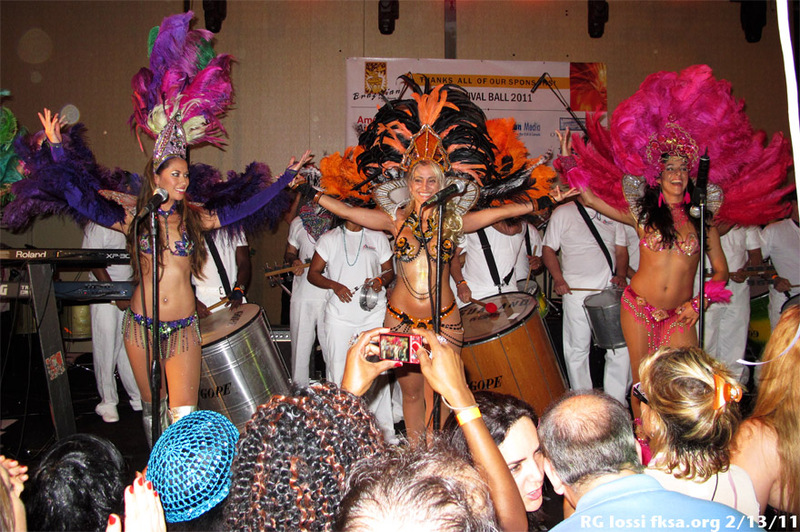 Samba dancers with lots of energy going off throughout the evening. 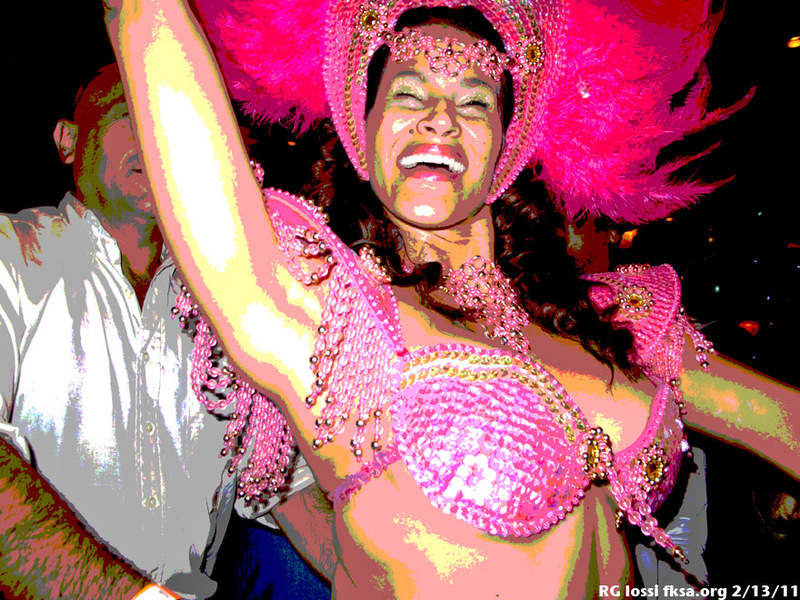 Paula in Roman carnival garb with his samba troops. 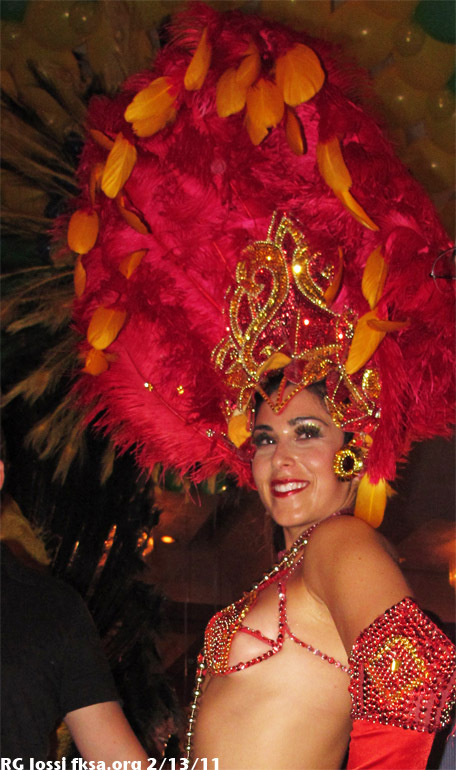 We've have seen them put on excellent shows at churrascaria over the years. I don't know how many people came to the ball but it sure seemed like a lot. 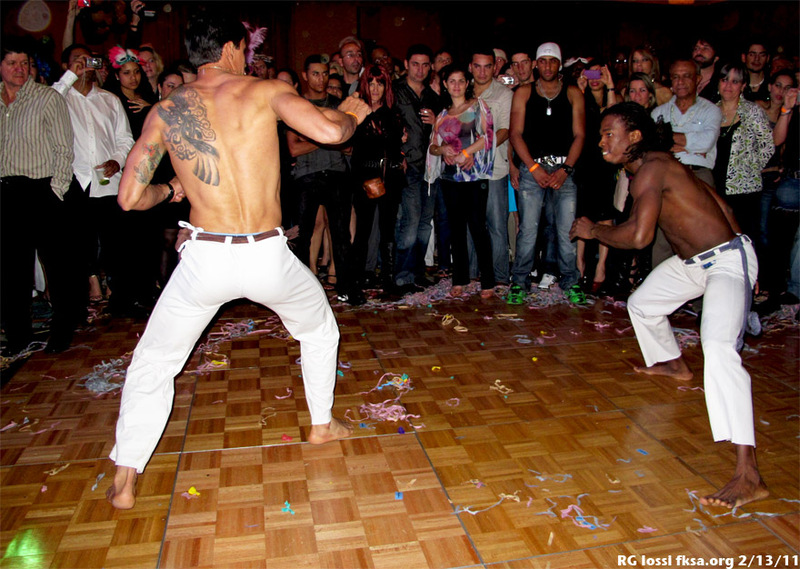 These Brazilians really know how to party. 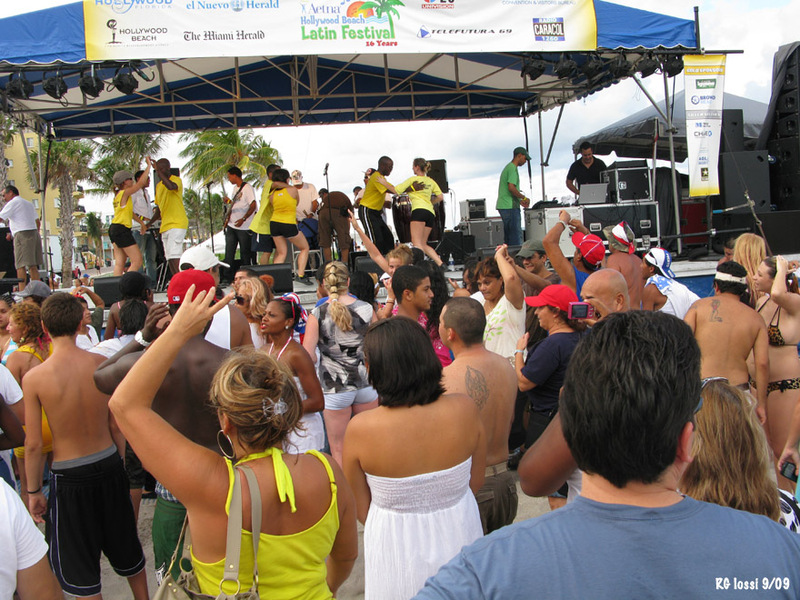 There was dancing from 10 pm on along with numerous stage shows. 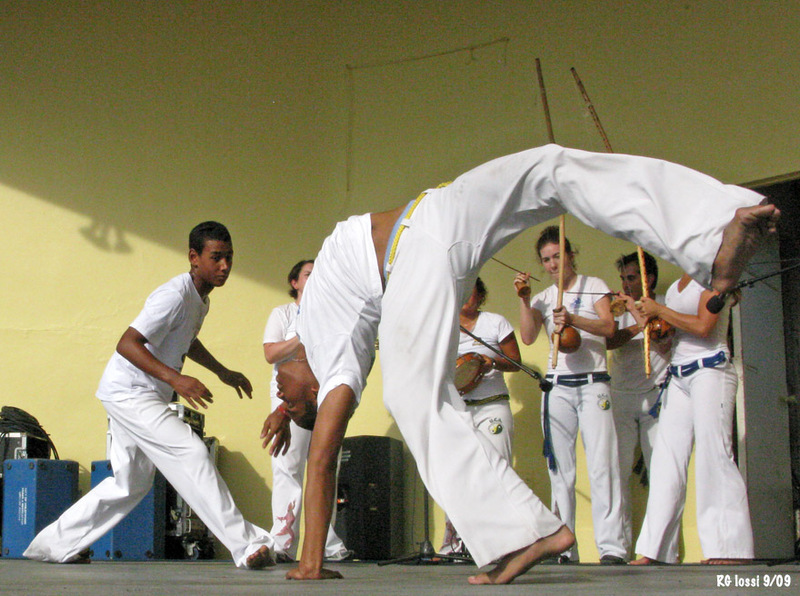 There was also a Capoeira show. People were encouraged to come in creative masks with prizes for the winners. 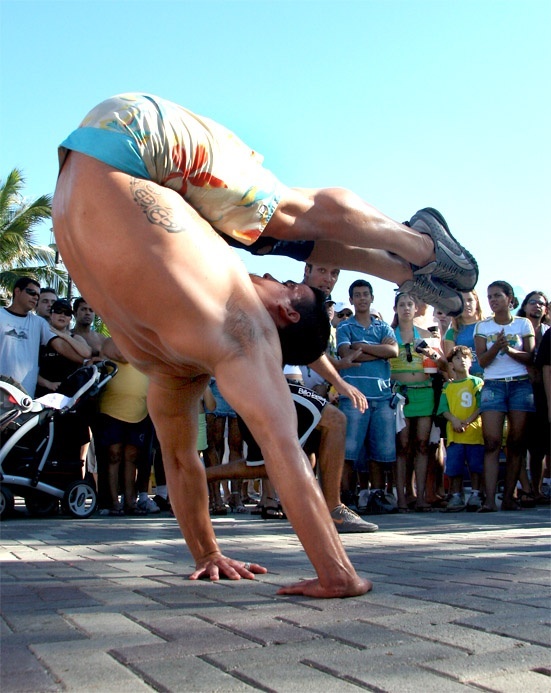 This fellow won a roundtrip flight to Brazil. 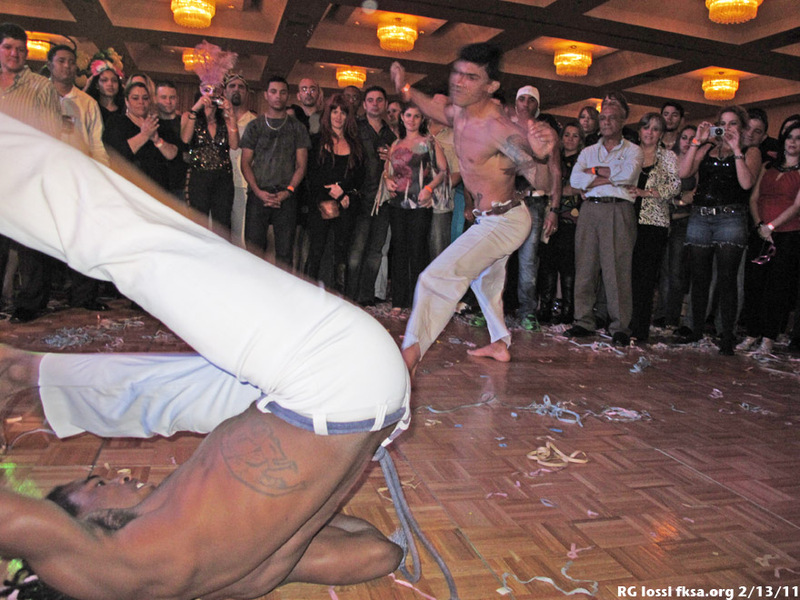 Great dancers go to it on stage. 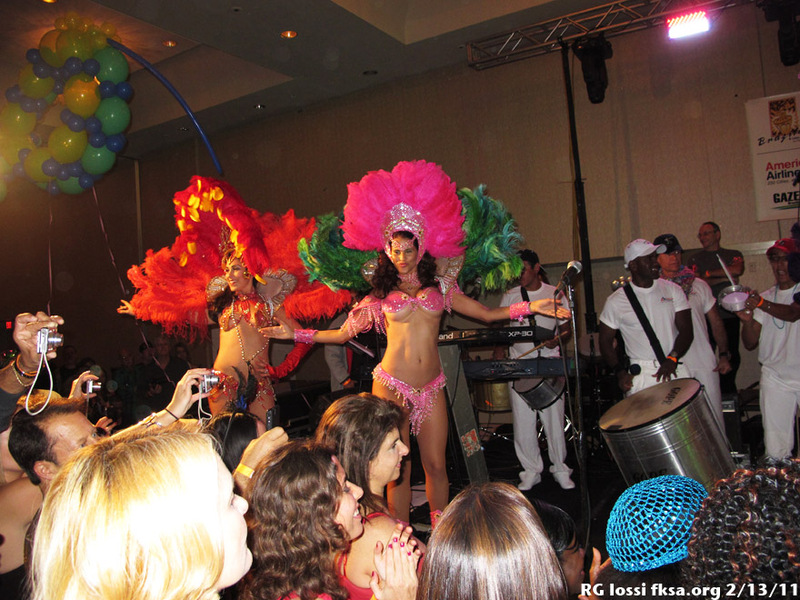 The obligatory conga lines, this time joined by the samba dancers. So, see you from this party. Should be another on tap a year from now. See you there.